Arranmore was originally a Bauman/Lutz Joint Venture with a designated builder- Nick Bunick Construction. The neighborhood was to be a “Planned Development” with Covenants, Conditions, and Restrictions to help guide an elected Board govern the Association. The neighborhood grew in three phases with over 3 miles of paved pathways and several acres of common ground, along with a wonderful swimming pool facility. Proximity to Downtown Portland is convenient with shopping of all kinds nearby. The meaning of ARRANMORE by Wikipedia: Arranmore Island (Árainn Mhór in Irish) is the largest inhabited island in County Donegal, and the second largest in all of Ireland. In Irish the island was traditionally called Árainn the adjective mór (large) was added fairly recently. The Irish word Árainn means “long ridge” which is apt description for the island. 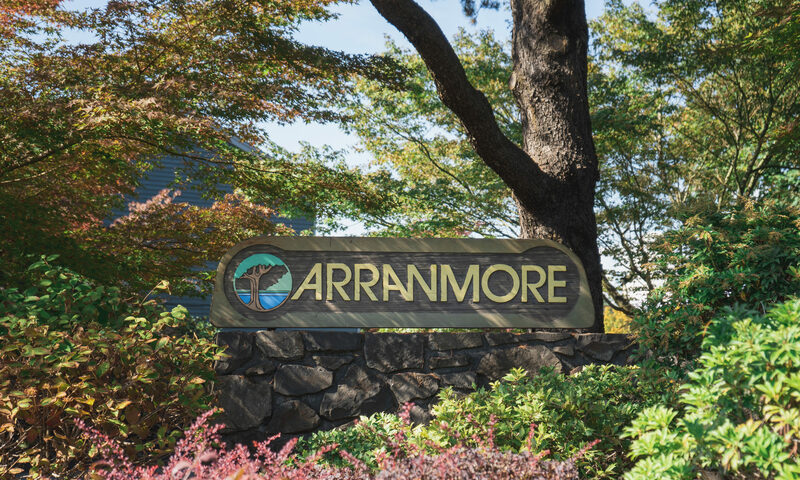 Arranmore possibly received it’s name because of is association with the Aaron Frank Estate, for which our neighborhood land was originally part of the grand estate located in what is known as “Garden Home”. He was part of the Meier & Frank family and the property’s home can still be seen because it is the club house for the Frank Estate Apartments. Today, when Arranmore is mentioned the usual comment is, “Oh, what a beautiful area. ” The words, BEAUTY, UNIQUE and DESIRABLE are synonymous with this residential community of approximately 150 homes. Beauty of course, is always in the eye of the beholder. While driving thru the entrance with its abundant seasonal plantings, it is apparent this is a carefully planned and well-maintained neighborhood. 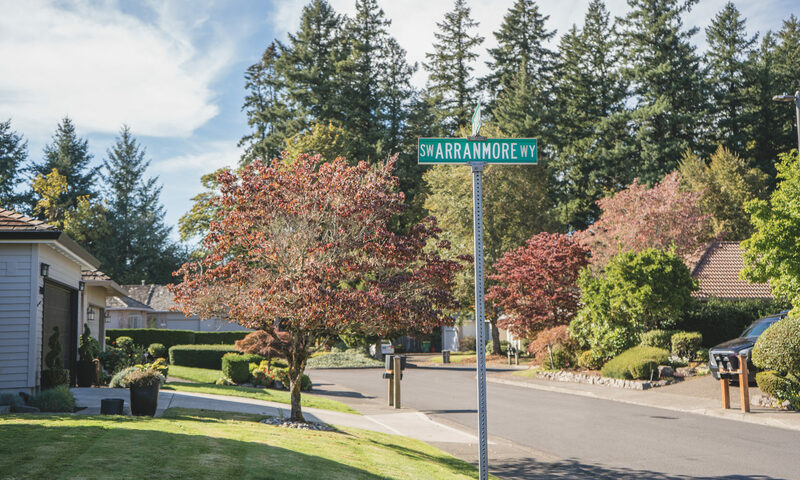 Only one road, ARRANMORE WAY, encompasses the tract of homes. There are almost a dozen cul-d-sacs off this main street. The size and layout of the community is a bit deceptive due to gentle slopes and several paved walkways thru green belts. It would appear the entire area was the result of a landscaper’s dream come true. The variety of trees and shrubs command one’s full attention. It’s not until after appreciating the beauty that one begins to analyze just what is the cause of such perfection. The answer is hidden. Hidden underground, for there are no unsightly utility poles and wires marring the appearance and skyline. Photography in this community is also another dream come true. The plat restrictions state all common areas shall be owned and maintained by the ARRANMORE HOMEOWNERS ASSOCIATION. This includes a centrally located community swimming pool. The common area upkeep is financed by yearly HOA dues. The Arranmore home sites were developed in three phases. The idea was conceived by W.C. Bauman, who on April 7th, 1958 purchased the majority of Arranmore acreage from Peter A. and Rosalie Gertsch (husband and wife). Later, additional acreage was purchased from the Aaron M. Frank estate. Interestingly though, the Frank property had originally been part of the Gertsch land. Christian and Katie Gertsch (husband and wife) along with Peter and Rosalie Gertsch sold Aaron Frank a small section on July 6th, 1945. Thirteen years later the Gertsch property was back together as Arranmore. An original 1907 tax map lists Bella S. Nechol as having 160 acres. This later became the majority of the Frank estate. Only a small portion of the Frank estate reverted back to the original Gertsch property. W.C. Bauman was the one instrumental in developing the layout, conceiving the idea of common areas and having the utilities placed underground. His son, Robert, joined him in the development venture in 1979. Nick Bunick, owner of his own construction firm was one of the early home building contractors in Phase One. His designs set a precedence of unique, well designed homes throughout the Arranmore community. The Hunt Club Association of Portland made several land purchases from the Gertsch family from 1910 thru 1917. Wouldn’t it be interesting if this land, too, reverted back and became part of the future Arranmore expansion. Thus keeping more of the old Gertsch property together. A parcel of Gertsch land that seems pretty stable is the section of land conveyed to school district #48 by deed, now known as Montclair Elementary School. Neighborhood Arranmore children can walk the common pathways to their school. Land owner records show on May 11th, 1900, Christian Gertsch purchased the future Arranmore neighborhood (85 acres) from the Alliance Trust Co. Ltd. Back then, the land was purchased for farming. Several large parcels of land were farmed in the same vicinity of the Gertsch farm. Names of the owners were well known then as they are today. All one has to do is look at a map to pick out A.J. Fanno’s farm. There was a creek running thru his property. B.K. Denny probably had the largest farm at the turn of the century. Today the Portland Golf Club sits on part of the Denny farm. And how did one get to his farm? By way of Denny Road, which is a major roadway today. Roads can be interesting, take Oleson Road that fronts Arranmore. Oleson road was formerly part of Ole Oleson’s farm. The surveyor’s map and hand written notes of November 15 & 16th, 1886 show Ole’s house was to the left and Ole’s barn was to the right of the road traversing the Oleson property. Continuing on, the road across the railroad tracks and then Ole’s meadow before it continued on to the Garden Home area. Back in 1886 Ole’s dirt road was known as Miller’s Ferry Road. Ole, his neighbors and other landowners who used the road wanted it to become a permanent, maintained roadway. So a petition was signed asking Washington County to upgrade Miller’s Ferry road to a County road. They were successful. Miller’s Ferry Road became County Road #179, later the number was changed to #905. On October 24th , 1924, A. A. Beebe signed a petition asking for more road improvements, he wrote, “The purpose of the road as laid out (proposed improvements) improves the alignment and reduces the grade, and we consider it a public benefit.” Not only were the improvements made on old #905, it also received a new name, Oleson Road. Would the past land-owning farmers approve the use of their land today? In the case of the Gertsch property, the answer must be, yes. Arranmore is a desirable a place to live today as it was back in 1900. Published originally as marketing material for Stan Wiley Inc. Realtors, Researched and prepared by: Stan & Joan Woolard, approximately 1990 titled “History of the Arranmore Community”.